State Rep. Josh Mandel drew a record crowd of 75 COASTers for a membership meeting, hammering the liberal Congress and Governor Strickland for taking our nation and Ohio in the wrong direction. The meeting also featured NAACP Christopher Smitherman launching COAST’s participation in the Cincinnati Trolley Charter Amendment petition drive and Cincinnati Tea Party founder Mike Wilson promoting their April 15 event on Fountain Square. Representative Mandel represents suburban Cleveland in the Ohio legislature and wowed the crowd with his record of fighting higher taxes and spending in his home town and in Columbus. Mandel is a likely candidate for Ohio Treasurer in 2010. Also featured at the meeting was NAACP President Christopher Smitherman who rallied COASTers for help in the Trolley petition drive. 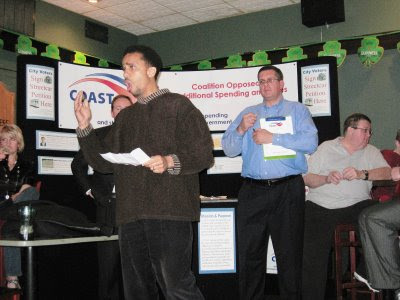 The NAACP is COAST’s partner in the WeDemandAVote.Com coalition which beat back the Super-Sized Jail Tax in 12007 and fought Red Light Cameras successfully in 2008. Republican Party Central Committee women Mary Anne Christie and Christa Criddle also spoke and asked COASTers to support the April 14 “Party to the People” rally featuring Ohio GOP Chairman Kevin DeWine.